Code 3 Retrievers provides Labrador retriever training, AKC and NAHRA hunt test training, professional gun dog training, and Labrador retriever puppies for sale. “My goal is to deliver a finished retriever that a person would want to hunt and live with,” John says. While some trainers have a “one method works for all dogs” approach, John recognizes that each dog has a unique personality, from “hard-headed but talented” to “soft but biddable,” and each retriever needs a training program tailored to his or her unique personality and talents. 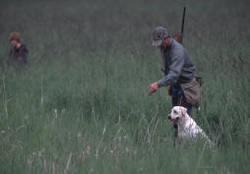 Consequently, John has qualified and obtain many performance titles with retrievers that other trainers had given up on. The AKC and NAHRA Hunt Test programs are the standard that accurately measures a dog’s capabilities in the field and marsh. John regularly competes in the AKC and NAHRA programs and qualifies over 90% of the dogs he runs in the Master level. Code 3 Retrievers occasionally breeds high quality Labradors, with the ultimate goal of improving not only our line but the breed as well. We strive to breed an athletic retriever that is pleasing to the eye and has the drive to compete at any level. In our program we only breed to the best Labrador Studs that have obtained at least a MHR or MH and prefer to breed back to Field Champions. Our dams are all Master Hunting Retriever level. We always offer a 2 year health guarantee and discounts on training fees when you purchase a Code 3 Retriever. We currently have an excellent MHR WR Code 3's Rescue Me I'm Hypothemic "Shiver" stud that is second to none. He has talent and personality to boot. If you see the words Code 3 on a pedigree you know its one of ours and it will perform. We welcome inquiries and are happy to discuss your pups prospects as well as provide you with assistance in finding you the right pup, even if it is not one of ours.